This week's Vikki's Musings is all about the console war. I have officially thrown my vote to Xbox One. I have preordered my Xbox and on November 22nd will be an owner of the new console. I have a few reasons for picking Xbox. I already have my Wii U so my need for Nintendo is fulfilled so I had to choose my second console. I am a huge fan of Kinect. I love my ability to move and command without the need for a controller in my hand. I have started to focus on my health and the video games that Kinect offers helps me to get healthy. I have Wii Fit but I did not take to it like I did the various workouts for Kinect. I am truly excited for this new Zumba and I look forward to working out with Kinect 2.0. The new Kinect has an improved depth perception and is three times more sensitive. There is a 60 degree field of view which allows for more people to play at once. The IR sensing lets it see in the dark which will be helpful when you are playing horror games and do not want a well lit room. Plus the skeletal mapping and muscle tracker are improved which will further help me in working out and focus on the appropriate muscle groups. I am very much interested in seeing how the heart rate monitor works out. I understand people are asking why they are forced to have a Kinect, well I ask them, with all the possibility of the Kinect why would you turn away such great technology. Another big reason why I am going the Xbox One route is because all my friends and family are on Xbox. I have a nice large amount of Live friends and I would like to buy the console that will allow me to play with the most amount of people. I know I will have people to race against for Forza 5 and the social aspects of the console is a driving force behind my choice. I enjoy being in my party and talking while I am playing even if we are not playing the same game. 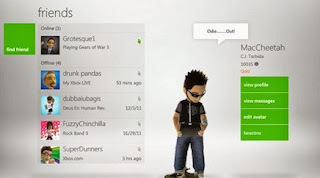 I like that I can easily transfer my gamertag over to Xbox One and I can allowed up to 1,000 friends on the new console. I doubt I will be anywhere close to that many people but I like having the option. The last and final reason I am going for the Xbox One is that it just looks damn good. The graphics look awesome and that is enough for me. When I watch the game play footage for Forza 5, I realized that for the first time I felt like I was in the car racing.